We're very stoked to premiere Witchdoctor's self-titled debut. The Milwaukee-based trio have kept a low profiling leading up to the release. This past summer, they were active and adding some funk and soul into the standard line-ups of Milwaukee summer shows. We first got a peek into their bold and bodied sound at our very own 'In the Garage' summer series, and they did not disappoint - all the more excited we are to premiere this. 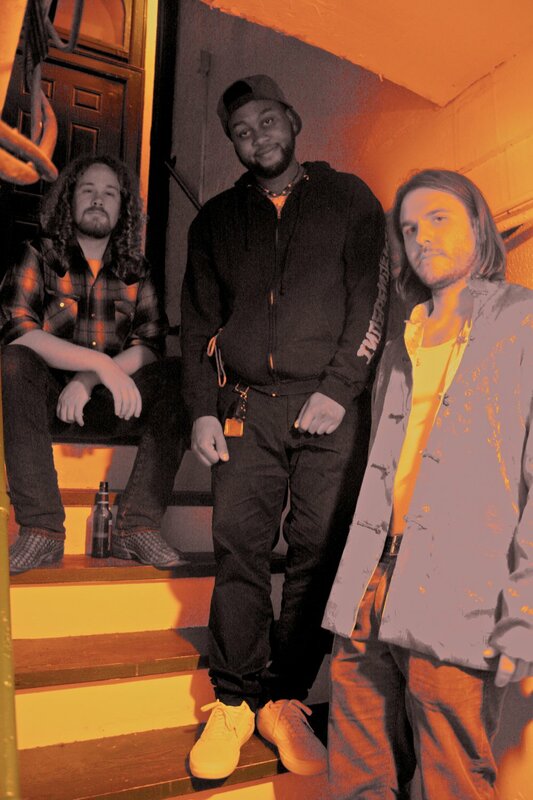 The trio, consisting of Rob Weiss on guitar and vox, Cameron Newman on bass, and Brandon Anthony on drums, have a diverse background and influence in music, creating a funky mix of sounds and jams. The 8 track album is a varied compilation that showcases the spectrum of genres Witchdoctor touches on. While predominately based on a funk-centric sound, throughout the record elements of country, rock, and R&B. The diversity and genre-bending combination makes it an easy-to-listen-to (and dance) piece. Milwaukee has a large and growing music scene that doesn't heavily foster soul and funk, what's your take on funk music in Milwaukee? Where do you see it going? Presently, funk music within Milwaukee is meager, with only a few bands regularly performing strictly within the genre. Certain jazz or rock n' roll bands may be "funky" sounding, but straight funk is hard to come by. That being said, the bands that are purveyors of the funk are all high caliber acts, and deserve Milwaukee's attention. It's always difficult to predict where any genre may be heading. Milwaukee's music scene tends to ebb to flow as with the larger business itself. A few years ago, I was very busy playing slide guitar in folk acts, and folky/country/old timey/bluegrass acts were all the rage. Yet, people move away, bandmates get sick of each other, the bottoms fall out. Now, it seems hip hop and jazz are doing really well. Much of the rise and fall of certain genres could be correlated to the popularity of the venues that are hosting the events. Ultimately, its best to just compose and perform what the soul desires. And that's what we do. This is a pretty collaborative album. With your various backgrounds, how did you come together and land on Witchdoctor's sound? It wasn't such an egalitarian endeavor from the outset, ie three independent personas with each's varied musical background painting our portrait on a blank slate. I had worked with Cameron in our previous band, Cherryball (another folksy act come and gone), and we had a shared interest in groovy music, not at all limited to the funk. Cherryball was simultaneously playing acoustic style sets befitting the folk scene, and had a funky alter ego regularly perfoming on funk and hip hop bills. This was also when D'Amato, a funky lil staple, was singing and performing with Cherryball. So the track had been lain long ago for an ensemble such as WitchDoctor to exist. (A few of the tracks on the record are from that early era.) Foreign lands called out to our drummer, but before he skipped town, he ushered Brandon into the fold, who had been performing with jazz and R&B acts. At that point the table was set. What I love about playing in this band, is that everyone listens to and is constantly exploring completely different music. While Cameron may be swooning over Gojira, Brandon's digging on Anderson .Paak, and I can't stop listening to the Carpenters. And week to week that combination of respective interest could radically change. In a Venn diagram, where we overlap becomes WitchDoctor. What/who would you say are your biggest influences for this album? Generally speaking, Jimi Hendrix, The Funky Meters, Average White Band, among others. But upon dissection, one might sense a little Mastodon in "Dronin," for example. The solo in "Tension" may or may not be emulating a Cobain solo-- each song is an amalgam of our different musical interests, but at the end of the day, we just wanted to make a dope record. Speaking for myself, leading up to the recording, I had been listening intently to Led Zeppelin's Presence, due to the similarity of instrumentation that we were expecting to utilize for our own record. We don't believe in modern medicine. It's best to go down to the river. What can we expect from Witchdoctor this year? We're in the embryonic stages of another record, but a timeline for a second record would be senseless at this point. This year we're hoping to be gigging more frequently, both in and outside Milwaukee. Soon, we'll have our physical release party somewhere around town. And I head there's some cool garage shows going on the in the summer.. You lovely people can expect us to keep keepin on.